“People say I am always smiling and happy, very bubbly”. Fiona is friendly, her bright and jovial personality shines through when meeting her in person to chat about her photoshoot. She loves “spending time with family and girlfriends, going to the beach and just being in the moment as the waves crash in.” It is easy to see how she spreads fun and joy with her family and friends. Fiona is mum to her 14 month old daughter, and is thoroughly enjoying motherhood. She has been making the most of her maternity leave before returning to work as a production supervisor in a global media company. Fiona was preparing to return to work when she applied to participate in the 38 Mothers Project “I have a full on job so, I have relished my year of maternity leave. Back to work next month!” It was a great time for her to do something for herself before heading back to work and balancing the demands of work, childcare and family commitments. Fiona quickly found her planning and list-making prowess which is crucial to her production supervisor role had to be abandoned for a more "go with the flow" approach when dealing with a newborn. She had read all the books and watched videos galore in preparation for becoming a mother, only to reflect back and now concludes don't over-research... "trust your instinct" and just go with the flow. As we discussed the then upcoming birth of my own son, Fiona related the importance of being in the moment “my mantra is take every day as it comes, and all things with babies shall pass - the good and the bad”. She impressed upon me about making the most of being in the present moment and cherishing those special times with a newborn. Since becoming a new mother, Fiona has a new found appreciation for her parents and her sister Ally, who is also a mother to an 18 month old. Fiona's respect and understanding for her sister Ally leapt when Fiona had her own daughter and she could now recognise the importance of family support when becoming a mother for the first time. When considering the role her own mother played in her life Fiona confided “she pretty much raised us on her own as dad was a doctor and always working. I never realised or appreciated this until I had my baby”. On the day of the photoshoot at our Portrait Photography Studio in Kingscliff Beach, Fiona brought along a range of beautiful dresses to wear. 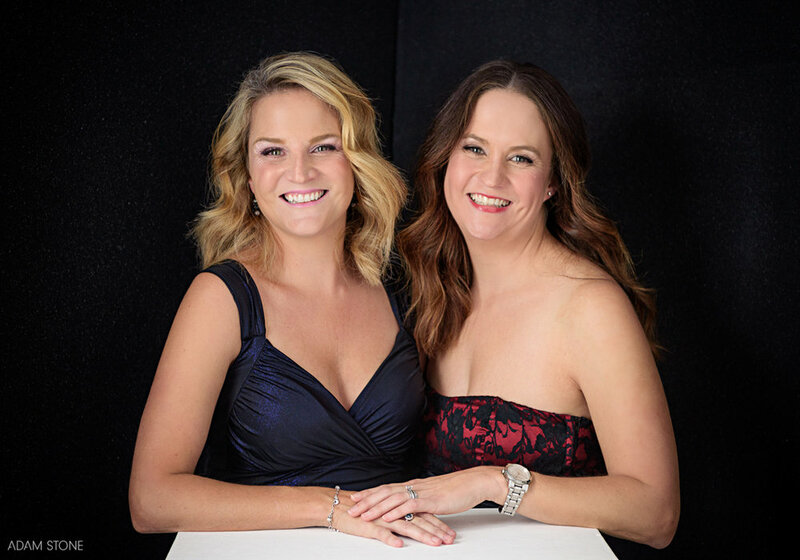 Fiona indicated she would love to have a beautiful and glamorous look… so with encouragement from Ashlee McDonald (our professional Hair and Makeup artist) she selected lovely dresses that sparkled, flowed and complimented her hair & makeup. Fiona looked stunning! With assistance from Ally who jumped in with a hairdryer to get the wind in her hair, and their favourite music on a ‘Finding your beautiful’ Spotify playlist, it was easy for Fiona to get into the groove of posing for the camera with a little guidance. Fiona and Ally were excited to make a fun night of their Portrait Reveal & Ordering session and so had their favourite bubbles chilling when I arrived. They were delighted to see their behind the scenes video and loved their printed portraits so much they found it difficult to narrow down their favourites. Fiona loved her dancing photos where she was smiling, her dress and hair flowing - it really captured her happy and fun personality. She encourages us to ‘Believe it will happen and try to enjoy the present, rather than worrying about the future’. It was really great to meet Fiona and have the opportunity to create a series of portraits she'll treasure. I've since become a father and am encouraged to focus on the present moment as our little boy grows. Thanks for sharing your story Fiona. I wish you the best in helping your child see the beauty in life's moments. Thank you to Ashlee of Ashlee McDonald Makeup & Hair for doing beautiful hair & makeup at our Portraits Studio in Kingscliff Beach.